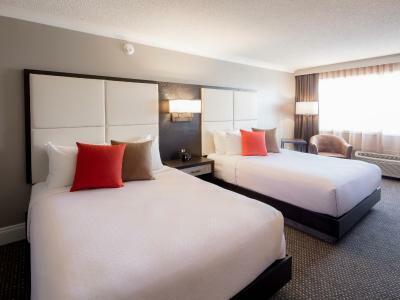 Lock in a great price for Crowne Plaza Hotel Moncton Downtown – rated 8.4 by recent guests! I liked everything, the staff was very friendly and helpful. The facilities were very clean and well taken care of. 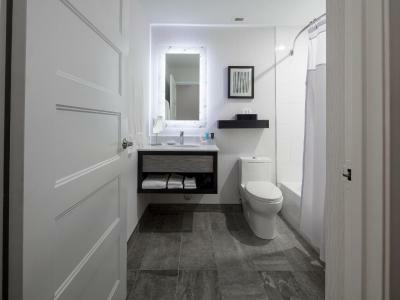 Modern, clean and full of amenities! Everything you need all in one spot. Comfy bed! Gorgeous hot tub, sauna and pool, we were able to enjoy all to ourselves the 2 hours before it closed. Splurged on room service as well, perfect presentation and service. This hotel is not in a great location, 8-10 blocks from downtown. Parking appears to be in a parking lot owned by the hotel, but they charge extra to park there. No ramp for suitcases. About 6 steps at parking lot entrance and about the same at the main entrance. Room was OK. Not great not too bad. Breakfast was extra and not that great. All in all I felt the place was riding on their name but way below the standard I expected. The room was extremely comfortable and soundproof! No noise from other people and was able to relax. The Hotel in General. Very nice and clean. Lovely rooms and excellent amenities. Staff and valet were very gracious and helpful. Gym facilities were excellent. 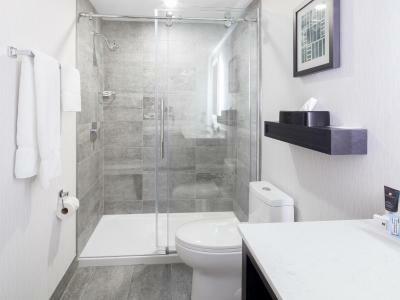 Crowne Plaza Hotel Moncton Downtown This rating is a reflection of how the property compares to the industry standard when it comes to price, facilities and services available. It's based on a self-evaluation by the property. Use this rating to help choose your stay! 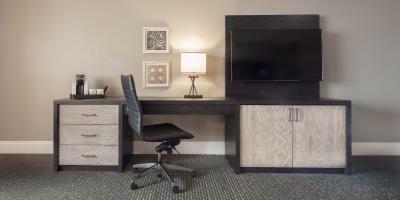 Featuring a completely nonsmoking environment, this Moncton, New Brunswick city center hotel is a 20 minutes' drive from Magnetic Hill Zoo. An on-site restaurant and free Wi-Fi throughout is also offered. Tastefully decorated, each room comes with air conditioning and a cable TV. A seating area and ironing are also included. Toiletries and a hairdryer can be found in the bathroom. Some enjoy a spa bath. 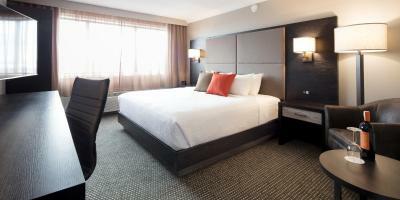 The Crowne Plaza Hotel Moncton Downtown provides a variety of on-site amenities, including a 24-hour fitness center. Guests can relax in the indoor salt water pool, browse for snacks in the specialty store or enjoy breakfast, lunch and dinner at the on-site T-Bones restaurant. Magic Mountain Water Park is within a 20 minutes' drive, while Crystal Palace Amusement Park is only 1.9 mi away from the Moncton Downtown Crowne Plaza Hotel. A number of local shops, restaurants and dining options are within 2 minutes' walk away. 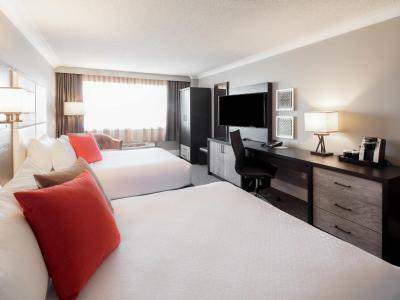 When would you like to stay at Crowne Plaza Hotel Moncton Downtown? Public parking is available on site (reservation is not needed) and costs CAD 12 per day. On the 7th or 8th floors, this room is in a designated quiet zone. 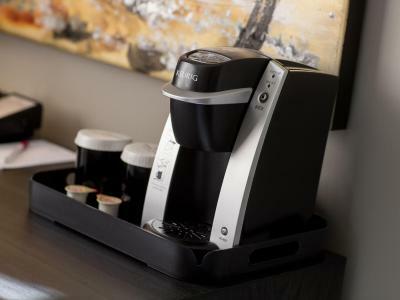 Equipped with a fridge, microwave, and coffee-maker for convenience. This large room features a sitting area with a sofa bed and work desk. A spa bathtub is also available. Sound barrier door strips are featured in this room. Cable TV and tea and coffee-making facilities are also provided. A sitting area with cable TV is featured in this room. Tea and coffee-making facilities are also provided. This family room features a seating area, cable TV and air conditioning. 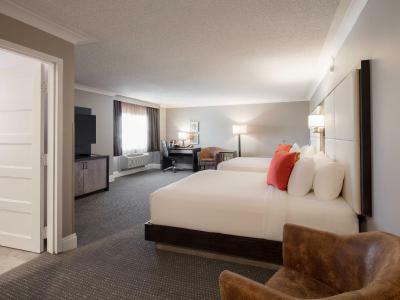 House Rules Crowne Plaza Hotel Moncton Downtown takes special requests – add in the next step! A CAD150 damage deposit is required on arrival (around USD112.25). This deposit will be fully refunded at check-out, as long as there isn't any damage to the property. Crowne Plaza Hotel Moncton Downtown accepts these cards and reserves the right to temporarily hold an amount prior to arrival. Please note that renovations are taking place from January 9th until July 8th, 2017. Guests may experience light disturbances but no services will be affected as a result of this work. No issues with anything during my stay. I booked a Pet-Friendly King Deluxe Room. I received my confirmation and everything looked great. When we arrived at the Hotel, they had no record of my reservation. I even gave them my confirmation. They gave us a similar room at no extra cost, but after unpacking, they decided we couldn't have pets on the floor we were on, so we had to move to a smaller room with a queen size bed. Of course we got a discount, but it was very inconvenient to have to move after unpacking. They did offer free breakfast to us. Overall, we were happy with our stay. My only question is why didn't they have our reservation? What would have happened if they didn't have any more rooms available? There must be improvements to this process. The elevator was really slow that's about it. Wish the water was hotter. Right across from the new Avenir Centre .! There were a bunch of loud children staying on our floor, running and rolling around the floors, yelling, and pressing every single button in the elevators. Perhaps the option of child-free floors or specific floors for families could be offered? We didn't encounter any staff we found helpful, unfortunately, all seemed overwhelmed with the number of people staying at the hotel. Understaffed? Ill-prepared? Not used to the new events Centre? Not sure what the issue was, but it caused long, frustrating waits to check in, check out, use concierge service, and eat at the lounge. Definitely one of the biggest hotel rooms I've ever stayed in. The space was wonderful. The beds were divinely comfortable - I slept better than I do when I'm at home! Lots of lovely pillows, perfect comforters. Blackout curtains were much appreciated. No issues with the wifi or the TV, and it was great that it had the HDMI hookup. Location was total perfection for attending an event at the new Avenir Centre, and it was a quick walk after the event to find an adorable nearby wine bar.